One of the biggest concerns people begin to have as they age is osteoporosis. Just the thought of the bones breaking owing to even a nudge is painful, imagine going through it! Is yoga good for osteoporosis? Research states that yoga can help reduce the symptoms of osteoporosis or even reduce the condition. Let us dig a little deeper and figure out the connection between yoga and osteoporosis. Osteoporosis is a degenerative disease. In this condition, the bones are weakened, and you are at a constant risk of having fractured bones. People have the highest bone density in their early 20s. As you age, the bone mass reduces due to various reasons. When there is too much breakdown of the bones and too little is built back, the bones tend to get brittle, resulting in fractures. Low levels of estrogen in women, low testosterone levels in men, lack of calcium, and vitamin D, sedentary lifestyles – all of these can be causes of osteoporosis. Yoga is a sort of strength training that helps you balance and align your body the right way. When your body is properly aligned, and you can balance, you automatically reduce probable injury. The standing poses strengthen your hips, which are sometimes the most affected by osteoporosis. Mild back bends build strength in the spine and decompress the vertebrae. Yoga also improves the circulation of blood in the body, which means better absorption of nutrients. But to benefit from yoga for osteoporosis, you have to practice it for 30 days at least five days a week. Having said this, you should not overdo the practice either. Start slowly with simple asanas, and then increase the time and the level of difficulty as you progress. You will notice significant changes eventually. But beware of some yoga poses to avoid with osteoporosis! You must consult your doctor before you begin yoga. You should also speak to your yoga instructor about your condition before you start practicing. 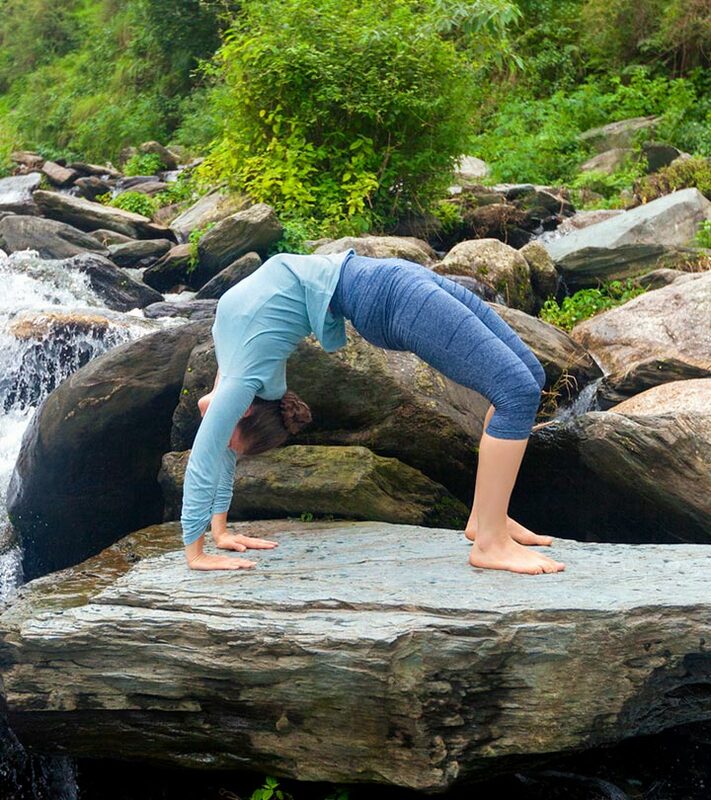 Benefits – This asana stretches, tones, and strengthens the bones in the lower spine, legs, and hips. It also ensures that every part of the body is oxygenated and balanced. It works on the reproductive system and improves hormonal imbalances. Just ease into the asana. Do not push yourself too much when you begin, or else you will be left with an injury. With practice, you can progress. How To Do It – Stand straight while placing your palms on your hips. Breathe in, and bend your hips as you breathe out. Place the palms next to your feet on the floor. Place the feet parallel to each other. Push the torso forward and extend your spine while lifting the tailbone. Hold the pose for a few seconds, and release. Benefits – This asana is amazing because it works on your arms, spine, and legs. It strengthens the muscles as well as the bones. This asana also helps improve the balance in the body. It helps with better circulation and hormonal imbalances too. How To Do It – Widen your legs, placing them hip-width apart. Twist the right heel, pointing the toes outwards. Pivot with the left foot. Ensure that the arch of your left foot is in line with the right foot. Lower your hips and radiate all your energy out as you stretch out your arms. The arms must be in line with the shoulders. Turn your gaze to the front, and take long, deep breaths. Hold the pose. Release, and repeat on the other side. Benefits – This asana is a balancing pose. It not only improves your ability to balance with the weak bones, but it also strengthens the bones in the legs, spine, and arms. This asana improves the nutrient absorption through blood circulation. How To Do It – Place your feet hip-width apart. Now, lift your right foot off the ground, and bend your body to the left, bringing your left arm to the ground for support. Once you are comfortable, place your right leg parallel to the ground, or lift it as much as you comfortably can. Raise your right arm up, and turn your gaze towards it. Hold the pose for a few seconds. Release, and repeat on the other side. Benefits – This asana stretches and strengthens the legs. It also works on the arms and the back. This asana massages the abdominal organs and the reproductive system, and therefore, hormonal imbalances are also rectified. There is also an increase in the absorption of vitamin D and calcium in the bones due to the enhanced circulation of blood. How To Do It – Place your legs hip-width apart, and twist the right foot such that the toes point outwards. Ground yourself using your left heel. Make sure that the arch of the left heel is in line with the right foot. Lower the hips and stretch out your arms. Now, slowly bend your body such that the right arm touches the right foot. Extend your left arm upwards. Look at your left arm and breathe. Release after a few seconds, and repeat on the other side. Benefits – This asana works wonders in strengthening your spine. It lengthens the spine, removing all the stress trapped in it. It gives the bones and hamstrings a good stretch, which strengthens the legs. The circulation of blood is improved, and hormonal imbalances are rectified. How To Do It – Come onto your fours, and gently lift your knees off the floor, thereby straightening them. You should ideally place your feet flat on the ground, but in case you cannot, it is ok to lift up on your heels. Take two steps backward, and once you are comfortable, work on the arms. Fold your arms at the elbows, and place your forearms flat on the ground clasping your palms. Lower your head to the ground, fitting your crown in your clasped palms. Your shoulders should come close to your ears. At this point, your body should resemble an inverted ‘V.’ Hold the pose, and breathe long and deep for a few seconds before you release. Benefits –This asana works primarily on enhancing blood circulation and strengthening the back. It is a great asana for women as it works on their reproductive system and helps rectify the level of estrogen in the body. How To Do It – Lie on your back, and fold your legs at the knees. Lift your back and hips off the floor. Also, ensure that you straighten the shoulders. Place your arms on the floor and stretch them out such that they reach your feet. Take three long breaths, and then release. 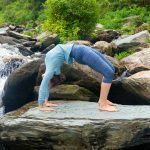 Benefits – You must make sure you practice this asana only once you have been practicing yoga for osteoporosis for a while, and you have seen progress. It is an advanced asana for osteoporosis, and can work as a check to see how much you have progressed. This asana enhances oxygenation and nutrient absorption all over the body, owing to better blood circulation. It also helps to strengthen the arms and the legs. Since the reproductive organs get a good massage, this asana also helps to regulate the hormones in the body. How To Do It – Lie on your back. 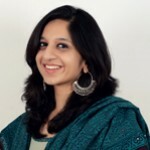 Now, place your palms on either side of your head, with your fingers pointing towards your shoulders. Bend your knees and place your feet on the ground. Whenever you feel ready, push your palms and feet to raise the rest of your body off the ground. You need to be very careful while doing this. Hang your head, look backward and hold. Gently lower your body, placing your head on the ground first, and then your back. Relax. 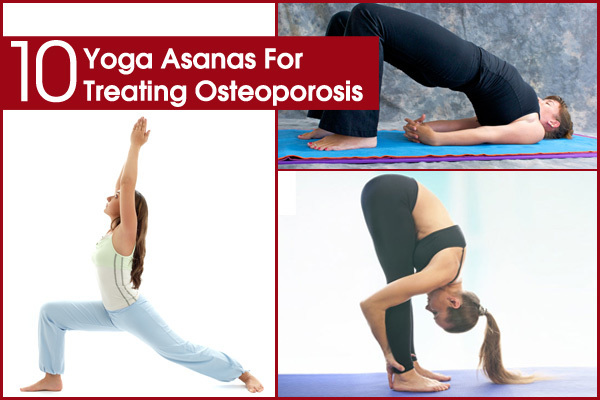 Have you ever tried any of these yoga poses for osteoporosis treatment? We definitely take our bones for granted. Don’t wait until it is too late! Regular yoga practice will prevent the problem from emerging altogether. But God forbid, if you do contract osteoporosis, you now know what to do.